As you enter the gates of this 2.37 acre estate, you will first see the beautiful custom water fountain. 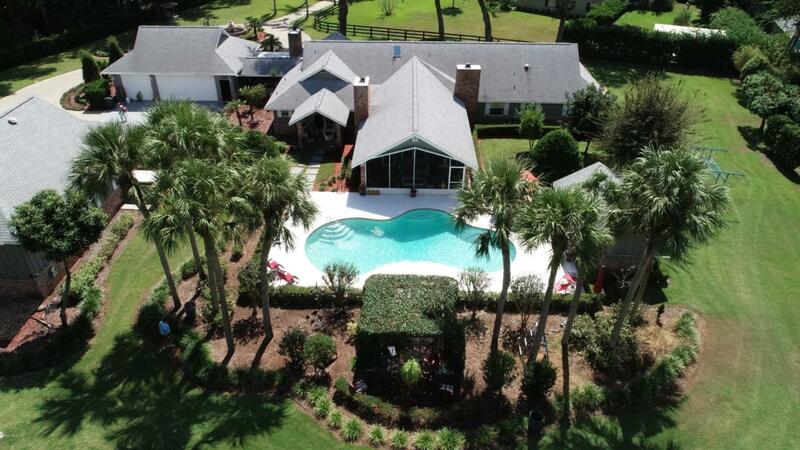 This unique 5 bedroom,4 bath pool home has everything you will need. It has garage space for 9 cars. It has a custom built 50'- 4 level tree house, a detached 28x40 garage (6 cars) or has been used for a party/dance hall. The pool is set up for entertaining with a cabana, complete with full bar and full bath. This magnificent home has 3 fireplaces, a huge kitchen (also set up for entertaining) granite countertops, lots of real wood cabinets. There is guest suite complete with living area and fireplace, and doors to the private pool table area. The master suite has a private patio, his and her vanities and walk-in closet and oversized shower area.Formal Dining room and fabulous great room with stone fireplace and doors leading to screened porch overlooking the pool. One guest bedroom could be easily split into 2 bedrooms for a total of 6 bedrooms. Main house has a 3 car garage, ( one is being used for a workshop). There is a fire pit for entertaining and a lawn equipment shed which could be converted into a barn for animals. This property is zoned for horses if you want to have a small mini-farm. All of this and only minutes from downtown Ocala. Make your appointment today for a private showing.